Why Does My Dentist in Tulsa Use Porcelain for Veneers? Veneers are among one of the most sought cosmetic dental procedures because they offer an effective solution to drastically improve the size, shape, and appearance of the teeth. However, in the past, many chose alternative options because they process was somewhat invasive as a large amount of the tooth’s structure needed to be removed during the bonding process. Now, your dentist in Tulsa uses those that are made from porcelain due to the various benefits it offers. When compared to veneers made from other materials, those that are made from porcelain allow the procedure to be minimally invasive. They are thinner than those made from other materials. As a result, less of the tooth’s structure must be removed during the bonding process. This allows more of your tooth to remain intact while also allowing the procedure to be completed in as little as two appointments. 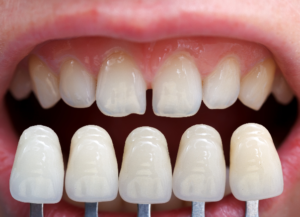 Veneers are quite versatile, allowing them to be used to correct an array of cosmetic flaws. Although they are thin, they remain effective for correcting the size, shape, color, and proportion of the teeth overall. This provides the perfect solution for hiding chips, cracks, discoloration, or minor alignment issues. Porcelain very closely mimics the appearance of enamel. When light reflects off their surface, they will look natural, so no one will be able to tell that they are in place. In addition, they are easily customizable to match the exact size, shape, and color you need. Although porcelain in thinner than those made from other materials, they remain strong and durable. With the right care, they can last for as long as 10 years before needing to be replaced. To promote their longevity, it is important to care for them properly by maintaining your oral hygiene, regular care from your dentist, and avoiding bad habits that can cause them to break, like chewing on your nails. Porcelain is also stain resistant, allowing your new smile to stay bright. However, they can appear discolored if you do not care for them correctly. Abrasive products will cause small scratches to develop on their surface. Food particles can become trapped in the tiny cuts, causing them to appear discolored. To ensure that they stay bright, it is best to use nonabrasive dental products. If you have felt insecure about the appearance of your smile for several years, it is time to invest in your confidence with porcelain veneers in Tulsa. In as little as two appointments, you will have a picture-perfect smile that will last for several years. Dr. Angie Nauman knew from a young age that she wanted to provide dental care to create healthy, beautiful smiles. In 2001, she began practicing as a doctor of dental medicine with a mission to continue her education to provide her patients with the highest level of care. If you are ready to transform the appearance of your teeth, contact your trusted cosmetic dentist in Tulsa today to schedule a consultation. Comments Off on Why Does My Dentist in Tulsa Use Porcelain for Veneers?